Last week my little family took its first post-baby vacation. My husband and I ambitiously traveled across this great nation with our nine month old son hoping for a relaxing week in the desert sun...how naive we were. Here are the highlights of our trip: 1) gunk oozing from baby's nose and eyes; 2) no sleep for parents; 3) lengthy visit to sub-par urgent care; 4) no sleep for parents; 5) antibiotics, both oral and eye drops; and 6) head cold for mom. Vacation? Well, we tried. At least it was sunny and in the 70s in the entire time...and Cameron did enjoy the pool when he was well enough to go in it. If any of you tech people out there are looking for an iphone app idea, I have one...Baby Traveler. The app would be able to help you figure out how to adjust a baby to a time change, point you in the direction of the nearest urgent care and pharmacy, figure out the best seats on airplanes, the best bathrooms in airports to change diapers, and play white noise and lullabies for the crankiest of times. Oh, and Cameron started crawling while we were on vacation, so now I have to keep an even more eagle eyed watch on him. 1. 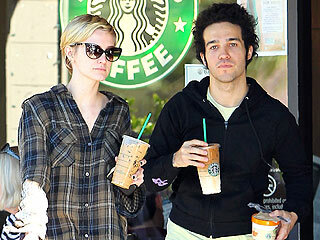 Ashlee Simpson and Pete Wentz are getting a divorce. I was a little surprised by this one. I am sad for them, especially because they have a two year old son. Of course, in their public statement they say that they will remain committed parents to son, Bronx. Well, I sure hope so...do you really need to say it? 2. Christina Aguilera flubbed the lyrics to the Star Spangled Banner at the Super Bowl. The media went crazy, but I just felt bad for her. It can happen and it is unfortunate that it happened to her at such a publicized event. I'm sure more happened, but I cannot think of it right now. I must admit that I am a bit overwhelmed because I have so much on my DVR to watch. I must catch up with The Real Police Women of Cincinnati! I also visited a Buy Buy Baby store for the first time during my vacation and I liked it so much better than Babies R Us. In the baby superstore world Babies R Us is now the poor man's Buy Buy Baby. More later this week...got to go catch my son who is trying to pull his dehumidifier down on his head.